Following Gordon Hayward’s departure from the Utah Jazz last year, it was expected that Joe Ingles, whom the team had re-signed to a 4-year, $52 million deal, would be an integral part of the team on both ends. 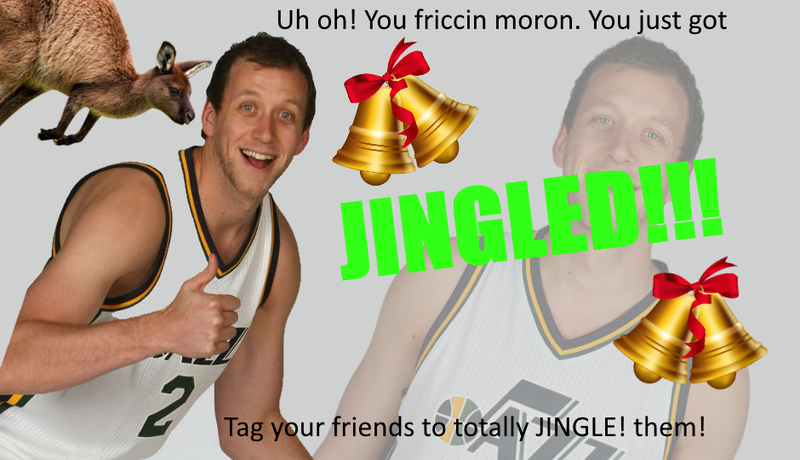 Ingles, who has somehow become the face of an underground internet prank, definitely delivered his end of the bargain, in more ways than one. Ingles has been getting more comfortable with his three-point shot, and was on a solid streak last season, kicking off his reputation as one of the league’s best shooters. This season, he’s made that even clearer, by breaking and setting a new single-season franchise record in three-pointers made. According to SLC Dunk, Ingles is joining the ranks of past Jazz sharpshooting legends like Jeff Hornacek and John Stockton, in terms of quality and quantity of threes over a season. According to NBA stats, the swingman ended the 2016/17 season with 44.1% shooting from downtown, averaging 2.5 threes on 3.4 attempts. This season, with 78 games played to date, Ingles has taken more shots (5.7 attempts) and made more of them (2.5 makes), without sacrificing any efficiency (44.2%). Ingles has managed this feat, by taking more quality shots in his comfort zone: off-ball shooting. Last season, 46% of his 3s came from catch-and-shoot situations at about 2.4 attempts a game. He’s optimised it this season, by taking 50.5% of his 3-pointers on catch-and-shoots, at a clip of 4.3 attempts a game. Let that sink in: that’s a 79% increase on attempted threes from last season, while maintaining that elite 46% shooting consistency. Ben Ladner from The Step Back did some good analysis about the way Ingles got into his shots. Through smart off-ball movement, Ingles often gets his defender to over-commit on moving one way. Once that happens, he zips off and uses other nearby bodies to create further separation, before getting the ball for an open shot. Make no mistake, Ingles has become quite the downtown specialist: he takes 67.3% of his shots from downtown. With his crafty off-ball movement, it’s no surprise that 42.9% of those shot attempts are classified as wide open, with the nearest defender being 6 feet or more away. That’s not to say Ingles doesn’t make pull-up, off the dribble threes. Faced with the right situation, he can and will take the shot. More like "Will-he Read the defense well enough to stop Joe Ingles?" Ingles is averaging 46.3% on field goals, 44.2% on threes, and 81% on free throws so far. It’s not quite the 50/40/90 club, but he’s proving his worth in the single statistical category that’s turned the league on its head in recent years: efficient, high volume three-point shooting. The assertiveness and confidence Ingles is displaying now, wasn’t always there, especially in the early days, as the forward recounted over an episode of The Joe Ingles Show with DJ & PK. “My shooting for instance. I’ve shot spot up threes for four years straight, however many a day, for so long. [It wasn’t] probably until last year, when I actually felt comfortable shooting some of them, but that confidence brings in a bit more confidence. Like this year, shooting off pick-and-rolls, in transition, when guys go under me, being able to just shoot it without thinking about it. Ingles also talked about how dedicated training with the Jazz has honed his shooting significantly. “For me, it’s been a huge part of my development, to be able to work on my own game. Obviously, I would never change my time playing for Australia in the offseason, but on the flip side of that, you don’t get time to work, because you get a break, and then you get into team stuff. For me, it’s been team concepts my whole career really, since I was 18 and was playing professionally for Australia. It’s not an understatement to say that Ingles is entering his prime, when it comes to shooting. Surrounded by the right cast, he is well capable of sustaining this level of shooting for years to come. Ingles, who talked about having an improved diet (and corresponding weight loss), along with consistent training as the key to coping with this season’s increased playing minutes, has made an impact on every facet of play, from defence to scoring to playmaking. “There are certain players that when they are on the floor make the whole greater than the sum of the parts,” Jazz coach Quin Snyder said on ESPN earlier this year. “Joe Ingles ‘the part’ has gotten better, and then Joe Ingles ‘the teammate’ makes other people better. “He’s a winning basketball player,” Gobert also shared. “He’s the kind of guy you want on your team when you want to win championships. He knows how to do a lot of things that help you win that you don’t see on stats. He’s a very unselfish guy, too, so it’s great for our team. Helping make people better? Unselfish? We knew it all along. Playmaking has been part of the challenge for Ingles this season, and he’s risen to the occasion. The forward has upped his production from 2.7 assists last season, to an average of 4.7. It was Donovan Mitchell who picked up most of the slack on pick-and-roll possessions, but Ingles has too. Compared to last season, when Ingles only averaged 1.7 possessions per game as the pick and roll ball handler, the 30 year old swingman now takes 2.7 possessions on a nightly basis. The forward handles his possessions with care, ranking second on the team in assist to turnover ratio, and leads Utah in assist ratio, which measures the percentage of possessions from a player, that end up as an assist. An unsurprising statistic, given how Ingles has always been the selfless team player. It’s hard to dispute Ingles’ influence on the Jazz as a secondary playmaker. He’s right behind Ricky Rubio in assists per game (Rubio leads at 5.4 APG), and has clinched double-digits in assists thrice this season. This season, Ingles has found partners in the Jazz bigs, Rudy Gobert and Derrick Favors. Again, some good breakdown from Ben Ladner on how Ingles plays at his own quirky Ginobili-esque rhythm to break defences down and find open teammates. Observe how Ingles gets his defender staggering one way, then the other, right into a hulking Gobert screen. Blake Griffin rotated correctly onto Gobert, who was rolling right down the middle, but was foiled by Ingles’ keen pass to a wide-open Favors instead. This was especially evident during a close February game against the Spurs, when the Ingles/Favors duo manhandled the San Antonio defence in the closing minutes with their pick-and-roll plays, and led the Jazz to a 101-99 victory. Hashtag Basketball’s Kevin Nye recently anointed Ingles with the Joe Ingles Award, which includes not being a prolific dunker, getting heaps of minutes, and being able to shoot 3s – while not being the team’s best player, and Ingles played the Spurs game to Joe Ingles Award-esque perfection. He logged the most minutes among all Jazz players with 38, ended that game with a classic Jingles do-it-all statline: 20 points, 7 rebounds, 5 assists and a steal, on 7 of 13 shooting from the field, and 4 of 6 from downtown. And yes – no dunks. In all seriousness however, Ingles has always been a sneakily good defender who knows his strengths and limitations. Rather than being exploited due to a lack of quickness, he often uses his length and anticipation to make the right defensive play. Ingles recalled his earlier rookie days, when opponents would often call for isolation plays against him, seeing what they thought would be an obvious mismatch. Watch how Ingles stayed ahead with solid footwork, even as Harris began his drive, and forced a difficult shot that clanked off the rim. If we were to sum it up, Ingles is a disciplined defender. The Australian swingman isn’t a high-risk gambler when it comes to steals or blocks. He stays on his feet, and more often than not, makes the right play on going for a steal or block. In this possession, Ingles forced Paul George to lose control of the ball, into what looked like a travel no-call. The ball swung over to a waiting Carmelo Anthony, but Ingles, who already saw where the ball was heading to, made a running leap to block the shot. Having Rudy Gobert as a defensive anchor certainly helps, but it takes mental focus to not lapse on your assignment and make mistakes. Watch how Ingles funnelled his driving opponent to the waiting Gobert. Rather than leave it to Gobert and risk confusion over a switch however, he stayed on his man, and made a block on the ensuing shot attempt. The Utah Jazz are currently 4th in the Western conference standings, with a 45-33 record and a 3-game win streak. Barring an unexpected Portland slump, the Jazz could remain in position and face the San Antonio Spurs in the first round. Regardless of how the rest of the season turns out, Ingles will likely keep a level head through the run, one that’s likely been influenced by head coach Quin Synder’s own approach to the game. When asked about his role as a leader in tough patches over the course of the season last month, Ingles had this to say. “It’s not so much about me playing well, playing bad, and playing not too bad. I think it’s a process of just getting better each week and each game. Like I said, if I’m 10 for 10, 0 for 10, we’ve won 10 or we’ve lost 10, I’m gonna say the same things and I’m gonna act the same way. “On the outside, you see it after the game – it’s a lot of frustrated players. We want to win, we want to get better. We’re professional basketballers who are pretty lucky to play for an unbelieveable organisation and you obviously want to win every game. Everything is a process, even when you’re not the Philadelphia 76ers. For the Utah Jazz, their Australian forward will be a key part of their postseason evolution, as they ready themselves at replicating –or possibly bettering– last season’s playoffs success. You just do you, Jingles. It is one thing to get a chance in the NBA, another to stick and improve every year, which is what Ingles has done. He plays every game and at times this year he has been the point guard. Shows how hard work pays off.